In order to become an amateur radio operator in the United States, you must first pass one or more multiple-choice exams to obtain a license from the FCC. These exams cover basic theory of electronics and radio, as well as FCC rules, and are administered by groups of volunteer examiners around the country, including a group here at Carnegie Mellon. We offer exams for Technician, General, and Extra class licenses. You can take any or all of the exams for a single fee. Knowledge of Morse code is no longer required to obtain an amateur radio license in the U.S. Please note that your Social Security Number or FCC Registration Number is required by the FCC, and you will not be granted a license if you decline to provide one on the application form. Certain exceptions apply for non-U.S. citizens who do not have a Social Security Number. Examinees concerned about the privacy of their Social Security Number are encouraged to request a FRN from the FCC before the exam date. This can be done by vising the FCC ULS Online System and choosing the "Register" button in the "New Users" section. Please contact us if you have any questions regarding these policies. The ARRL Store offers many study guides in print and audio format. Additionally, the actual questions that you will see on the exam are published for anyone to review (granted, there are hundreds of possible questions and only a few dozen will be randomly selected for your exam, so you probably shouldn't try to memorize all the answers). Many web sites offer practice tests, including QRZ and AA9PW. Exams are usually held on the B level of Hamerschlag Hall on the Carnegie Mellon campus. Metered parking, which is free on Sundays, can be found along Frew Street. Free parking is also available on the weekends in the East Campus Parking Garage. Hamerschlag Hall is the building with the turret on top, overlooking Junction Hollow. 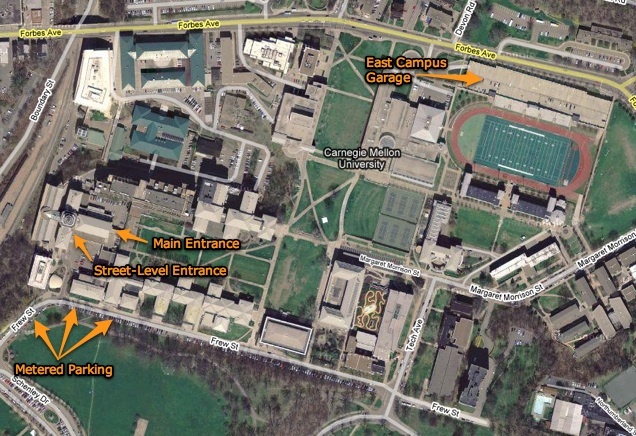 If you should find that the street-level building entrance is locked, proceed along the sidewalk past the parking lot gate, through the archway, and up the steps to reach the front entrance of Hamerschlag Hall. Once inside, take the stairs or elevator to level B.